The SCAD file is commented - but I am sorry, no other explanations for it are available. And I admit that the technique I used here is somewhat untypical for OpenScad: Essentially, each object consists just of two arrays of blocks, the first one are additive blocks, the second one cavities that are to be cut out. A normal "cube" type block consists just of two entries: the origin point and the size. A cylindrical block consist of the origin followed by an array [direction, radius, height] where direction is (-1 for X, -2 for Y, -3 for Z). Finally there are also optional 3rd , 4th and 5th entries in each block which can be used to specify the value of $fn (i.e. the number of corners used to approximate the cylinder), the level of the block (lower levels are generated/subtracted first) and a condition string (allowing blocks to be only generated under certain conditions). With this information and the comments in the block list you should at least be able to understand the structure of the objects. I tried this with marlin 2.0 bugfix and ramps_fd_v2 (tinyoled uncommented), but display and eeprom are not working at the same time. Eeprom only is working. Display only is not working, but it is working for a second when i press disconnect and connect in pronterface. then it goes black again. Does anyone have this working with Due? I've solved the issue for the EEPROM I2C on Arduino Due (RAMPS4DUE project) in a very easy way. 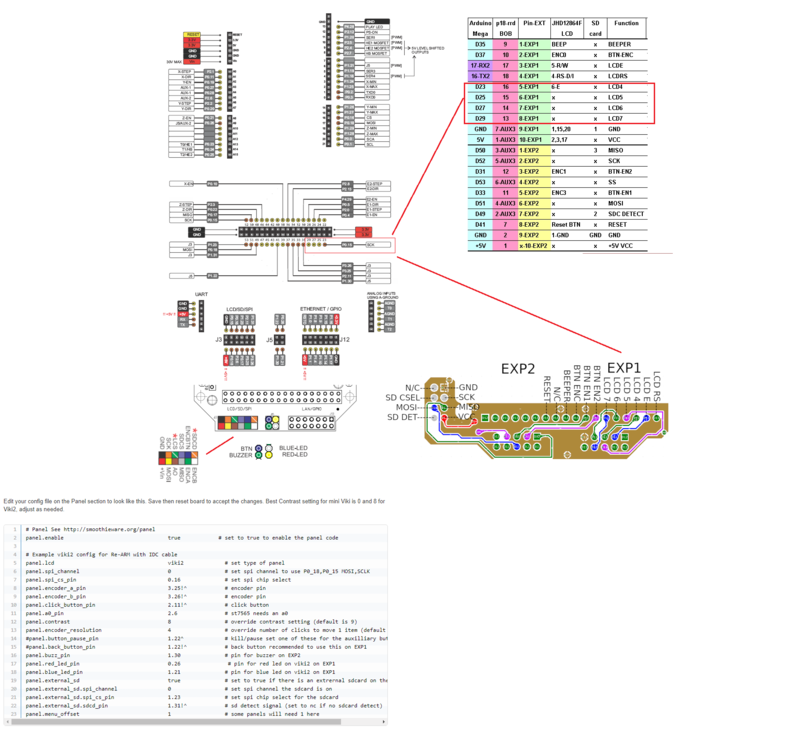 - Connect the EEPROM on the 2nd I2C, dont' forget to add a couple of 1.5K pull up resistors between SCL1 to 3.3v and SDA1 to 3.3v (the pull up resistors are already implemented on the 1st I2C (D20 and D21) of the Due board. #define EEPROM_CHITCHAT // Please keep turned on if you can. // this could be done more efficiently with "acknowledge polling"
Now you can use both I2C OLED and I2C EEPROM at the same time. Edited 1 time(s). Last edit at 07/11/2018 01:30AM by Skytter. - Geeetech I3 Pro B "Tuning" GT2560 A+ con sesto Stepper Driver e 3 estrusori - Doppio Alimentatore e Scheda Mosfet per l'HeatBed - Dondolo per I3 Pro B - Diamond HotEnd color mixing - Mk8 Extruder 0.2 nozzle. - TronXY X5S con Ruramps4d in fase di test. - Progetto "MiniMaker" full stroke 200x200x180 printer in a 300x300x300 cube. Edited 1 time(s). Last edit at 09/20/2018 03:08AM by mdg1. Please give us more details (and maybe pictures) of what hardware you actually have (display controller, 3D printer controller) and which version of Marlin you are trying to patch. It is MKS gen 1.4 display is 1.3"
Did you really build the "Tiny OLED I2C" controller which this thread is about? If no, what exactly do you mean when you say "1.3 inch OLED"? Please show some photos of your hardware. Edited 1 time(s). Last edit at 09/23/2018 04:04AM by mdg1. Are you sure 1.8.5 is your version of Marlin? I coudn't find it. 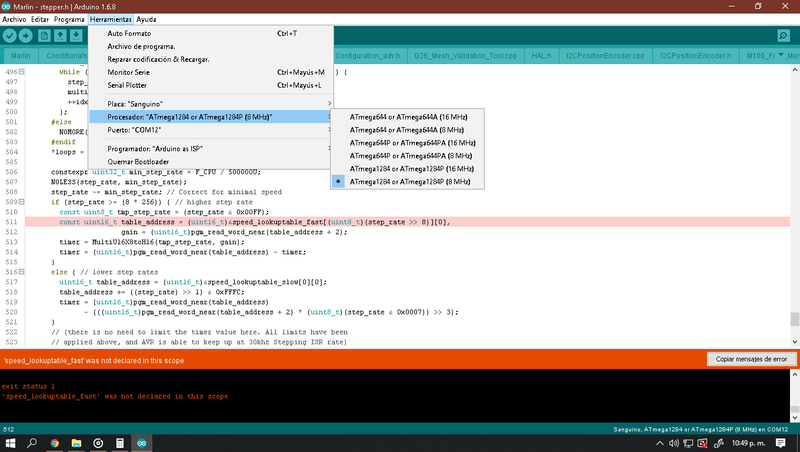 Might 1.8.5 be the version of the Arduino software you are using? Edited 1 time(s). Last edit at 09/23/2018 10:22AM by enif. I am trying to build one of these up as well. Regarding Marlin- is the config file changes listed in the above post the same as the option for this entry for graphics control panels in Configuration.h file? I am not good with code and am having trouble following the files and calls. Edited 1 time(s). Last edit at 09/29/2018 12:20AM by sinned. No, I don't think OLED_PANEL_TINYBOY2 will work correctly, AFAIK it's not exactly the same. The OLED dislpay will work, but I don't think that the rest will all work. But you can try it. EDIT: I used the above edits in a fresh download of 1.1.9. The line numbers were close, not exactly perfect, but not far off. I do question a couple of lines- in the first part of the diff, you added commented lines for U8GLIB entries? are they needed if they are commented? my display works but my buzzer doesn't- could be my buzzer, but having the oled and encoder is tops! EDIT 2: turns out its NOT the piezo buzzer, but Marlin config. You have to enable the following lines- ~ line number 1510 to get feedback sound. I can not remember previous versions settings. // If you have a speaker that can produce tones, enable it here. // By default Marlin assumes you have a buzzer with a fixed frequency. // The duration and frequency for the UI feedback sound. // Set these to 0 to disable audio feedback in the LCD menus. Edited 5 time(s). Last edit at 09/30/2018 02:52PM by sinned. Where is kill button ? In configuration.h i selected my anet board and defined U8glib_ssd1306, oled works fine. 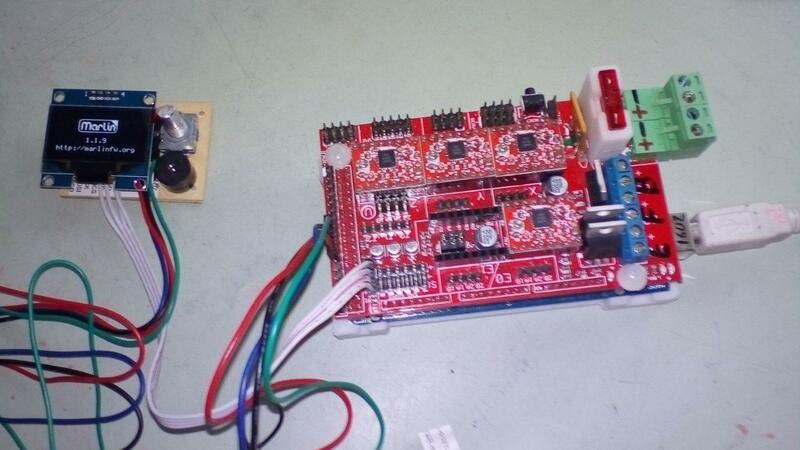 I don't know the Anet board nor how exactly you have connected the encoder and the buzzer to the board. define the pin numbers for the 3 encoder pins BTN_EN1, BTN_EN2, BTN_ENC and for the buzzer pin BEEPER_PIN. Edited 1 time(s). Last edit at 01/25/2019 03:08PM by VDX. - Where do you get "8MHz errors", what is the exact error message and from which program? - How did you connect you OLED? Pictures? - Which version of the Tiny OLED do you have? Is it the one described here? or one bought from China? ... or just a bare OLED? I suspect they simply selected the 8 Mhz processor option for the sanguino... vs the 16mhz as it should be. In Configuration.h add a line "#define TINYOLED" and make sure that you don't have any other display controllers defined. These are only the changes for configuring the Tiny OLED, not including any changes specific to the Sanguinololu and the printer itself. @juansuarez do not choose 8mhz. the sanguinololu board is 16mhz. with the correct values for the two lookup tables. But if you don't have a 8mhz Crystal or resonator, it may compile, but it will not work, as the serial baud rates will be at the wrong frequency. Edited 6 time(s). Last edit at 02/01/2019 04:47AM by Dust. are you using this on Marlin 2.0 8bit or 32bit? i was hoping to switch to 32bit with ReArm but I am a little stumped right now how to configure it. ReArm does use SPI - can we use that per Biachifan's post on page 2? There is the 'universal adapter' using a arduino nano as a go between but that seems to go against the simplicity of the TinyOLED. One can use the RRD smart adapter controller adapter with ReArm - can we hotwire those pins to the display .